Firefights working an explosive wildfire that’s tripled in size since Friday and is now burning in three Northern California counties — Lake County, Yolo County, and Colusa County and is only 12 % contained. 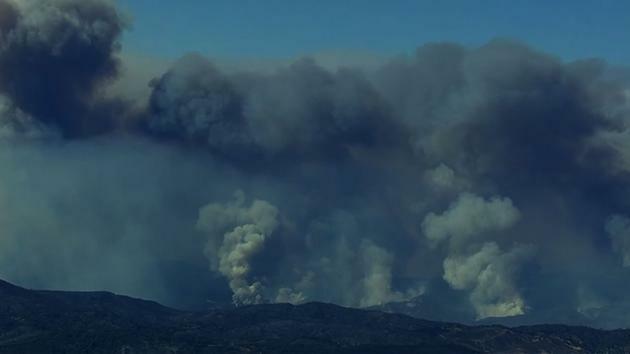 The Rocky Fire is now 60,000 acres, only 12 percent contained, and has prompted mandatory or voluntary evacuation orders for more than 12,000 residents. The wildfire has destroyed 50 structures, including 24 homes. The fire jumped Highway 20 and started a 100-acre fire in multiple spots, which firefighters were aggressively attacking Monday afternoon. Firefighters say they’re feeling optimistic about the new containment number. They say the weather looks good for the next three days and that Sunday night was one of the quietest nights on the fire line. They know, however, that spots can flare up in the afternoon when the winds pick up. As a result, crews are still keeping a very close eye on things, putting water on hotspots, and clearing residents out of the area. There are nearly 3,000 firefighters currently battling the Rocky Fire, and more are arriving Monday. Residents say they are impressed and grateful. “These guys are great,” said Lake County resident Rick McCune. “The winds are really bad, and that’s the problem. Firefighters say even though it looked calm Monday morning and they’d more than doubled their containment lines, residents need to keep their head on a swivel. The fire grew so dramatically over the weekend that they just don’t know what it will do. Crews say you may not be affected this second, but that could change. So far, 13,118 people have been evacuated. Firefighters say the goal today is to box in the fire by using Highway 20 and Highway 16 as the perimeter. They want to keep it in that area and not jump over. They believe the weather may be in their favor over the next few days and maybe they’ll be able to turn the corner on this one.